Benjamin Jones, MD was a member of the 2004 All SEC Swimming and Diving Team. Only a few people can say they've competed with, or against, Olympic swimming phenom Michael Phelps. Benjamin Jones, MD, a specialist in medical oncology and hematology at Alabama Oncology at Grandview, is among them. Jones, a 13-time National Collegiate Athletic Association All-American, made his mark at Auburn and had a brush with Olympic contention. Jones first plunged into swimming at age 10, participating in a summer league. By his high school junior year, he was high on the recruitment list for several colleges as a top contender in freestyle competition. "I qualified for the 2000 U.S. Olympic trials which was my first taste of international swimming," Jones said. "I was still in high school so I was overwhelmed to see these incredible athletes. It was a good experience." After returning home from the trials, Jones accepted both academic and athletic scholarships to Auburn where he trained with David Marsh, one of the head coaches of this year's U.S. Olympic Swim Team in Rio de Janeiro. Marsh coached the Auburn swim team that won 12 NCAA titles and 17 SEC crowns from 1990 to 2007. 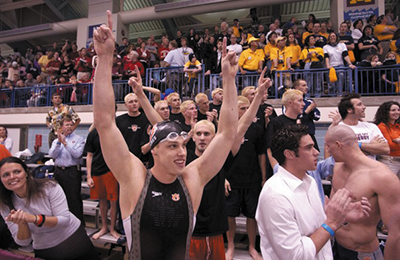 "Auburn swimming was the best program in the country at that time," said Jones, who captained the team in his 2005 senior year. For a time, Jones held the Auburn University record for the fastest 1,000-yard freestyle. He was a member of the 2004 All SEC Swimming and Diving Team, a 2004 USA Swimming Olympic Trails Finalist in the 400-meter freestyle and a 2004 Southeastern Conference Champion in the 500-yard freestyle. He also received the 2005 Cliff Hare Award, the highest honor given to a male Auburn University student athlete, and the 2005 Auburn Swimming Award, the highest honor for a graduating Auburn swimmer. "It was an exciting time," Jones said. "I got to travel the world and go to different meets. I got to meet President George W. Bush (Jones was honored at the 2005 Champions Day at the White House). "To be a college swimmer takes an incredible amount of time management and dedication to a goal. The collegiate season starts in August, and the international championship meet is in March. Every day in winter and spring, you have two-a-day workouts, along with class and other activities. We had only one night a week, Saturday, to enjoy. Every other morning besides Sunday, we were practicing. It was incredible. We were all focused on the goal of winning the national championship every year. Having 30 guys with one goal was a wonderful experience." Jones sees parallels between his work as a physician and the early foundation he established in pursuing his athletic goals. "Medicine is a team approach," Jones said. "In oncology, you orchestrate like a coach. You get people in place to help the patient navigate their way through this journey they are on." Jones has firsthand experience with the challenge a cancer patient faces. When he was young, his grandfather was diagnosed with non-Hodgkin's lymphoma, and the interaction he observed with the treating physician made a lasting impression. "He was a compassionate oncologist who was interested in my grandfather as a person and tried to do the best for him," Jones said. "That piqued my interest in medicine. I like to help people when they are most sick and vulnerable, and shepherd them through the curative process or end of life." Jones said that for those who want to have conversations about faith, it gives him an opportunity to share his convictions and offer some comfort, when appropriate. He also looks ahead to the medical breakthroughs that could be just around the corner. "New therapies are being developed every day," Jones said. "I believe in my career we will see some cures and some important advances in cancer therapy." Jones doesn't consider the discipline it takes to invest time and energy into athletics or medicine to be a personal sacrifice. No matter how rigorous the schedule or the physical toll, the payoff comes with the satisfaction of a sense of accomplishment. "When you love something and are working with other people with the same goal, it's a wonderful thing," he said. "After I finished swimming, I had a deep hole in my life that I needed to fill. Medicine filled that for me. I found a passion there and a way to pour myself into something new. The discipline goes full circle."